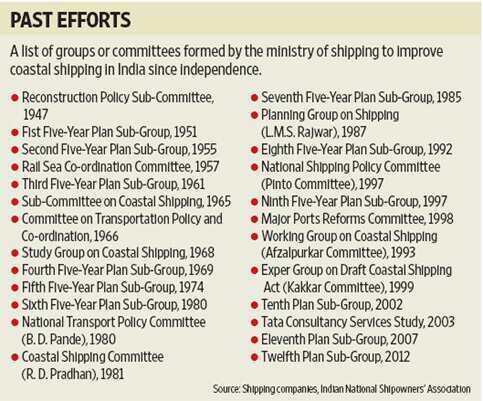 Mumbai: Twenty-four committees and study groups since independence haven’t been able to lift coastal shipping in India. Advocates of the trade are hoping the 25th—a sub-group on coastal shipping for the 12th Plan period that begins in April—will succeed. Coastal shipping and cargo transportation by rivers are cheaper and less-polluting than transportation by road and rail networks. 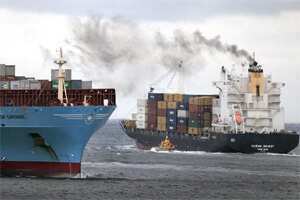 This, as a result, forces consumers to pay more for goods and creates external costs to society in terms of pollution, accidents and road and rail congestion, say shipping industry experts. The US carries 16% of its total cargo by domestic shipping, and the European Union, 46%. Coastal or domestic shipping is the movement of cargo by sea, river, canal or stream between sea and inland ports and terminals in India. Cargo transportation through rivers is known as inland water transport. “I attended (my) first seminar on coastal shipping in 1985. Since then, very negligible things (have) happened in the sector," said Avinash Batra, chairman at Seahorse Ship Agencies Pvt. Ltd, a shipping transportation company. “The government should take the lead rather than private companies investing." A representative of a shipping company, requesting anonymity, said private companies are unlikely to invest in domestic shipping unless the government sets up the basic infrastructure or offers incentives for coastal shipping and inland water transportation. The government’s priority, however, is road transportation, considering the demand, said B.K. Chaturvedi, member, Planning Commission, the country’s apex planning body. He was in Mumbai for a seminar organized by the Bombay Chamber of Commerce and Industry, a lobby group. According to S.N. Srikanth, senior partner at Hauer Associates, high costs at the Union government-owned ports, poor awareness of the potential of domestic shipping, poor water depth, antiquated handling equipment, and duties levied on fuel for coastal ships are the main hurdles in developing domestic shipping in India. None of the major ports has a dedicated terminal to handle coastal cargo, he said. Srikanth said that such vessels and cargoes should get at least a 40% concession in charges. “There should be 100% government funding to states for development of waterways in the North-East," he said. But funding available to the sector is negligible. The government has invested ₹ 1,100 crore on inland waterways so far since 1947, while spending ₹ 4 trillion on roads, ₹ 90,000 crore on rail and ₹ 60,000 crore on airports, said Bhupinder Prasad, chairperson, Inland Waterways Authority of India (IWAI). China invested $15 billion (Rs 79,000 crore) on inland waterways in 2006-10 alone, she pointed out. The ministry of shipping created IWAI in 1986 for developing and regulating inland waterways. “One 1,000-tonne barge in land waterway is equivalent to 100 trucks. Inland waterways require nominal land acquisition and is best suited for bulk cargoes," she said. Compared with road transportation, water transport is six times more fuel-efficient and can carry large parcels, Hauer said in a presentation. Water transport consumes only 4.83 grams of fuel per tonne kilometre, while road transport uses 31.33 g and rail, 8.91g, according to the firm. Hauer also said India has the highest number of road accidents—135,000 died in road accidents in 2009. China recorded 90,000 roads deaths that year. Besides, transport emissions are responsible for 12.5% of greenhouse gas emissions in India; 87% of this is from road transport. Though there are no concrete development on coastal shipping in India, several companies, including Essar Shipping Ports and Logistics Ltd, Chowgule Steamships Ltd, Eastern Bulk Co. Ltd, Atlantic Shipping Pvt. Ltd, Galleon Shipping Pvt. Ltd and New Era Shipping Ltd have registered their vessels as river-sea vessels—a technical term that reflects the coastal shipping nature of such ships. These companies have opted for this categorization in anticipation the government will change its rules to favour coastal shipping soon. The government’s holding out another sliver of hope. “We are making special legislation to promote coastal shipping and we expect that it would be approved by the government in this fiscal," said Satish B. Agnihotri, director general of shipping. “The policy will have incentives for private players. It will also fix what are the responsibilities for private and government agencies with timeline so there are no escape routes," Agnihotri said. “Please wait for it."